Louisiana is one of the oldest states of the US and contains a lot of history. Here are a few facts about the Louisiana state that you might not know. As traditional travel enthusiasts we look only to the history, monumental grandeur and the food and architecture of a place, but among all these, Louisiana also has some curious facts to share which you can go through once you are there. Check the climatic variations if any, before you go. Apply for the U.S. online travel authorization – ESTA from the comfort of your home. We will send it back to you approved by email! The very first thing to know about Louisiana is that it is named after the French king – King Louis XIV. Louisiana is nicknamed as Pelican state because it was a habitat of pelicans. Louisiana is also known as Bayou state. Louisiana is the proud owner of world busiest port. New Orleans is known as the biggest city in the state. It was ceded to the Spanish empire by signing the Treaty of Paris. The state capitol building of Louisiana is regarded as the tallest state capitol in North America. It homes 34 floors, and it is 450 feet tall. It is one of its kinds of architectural peace. Sulfur, salt, oil is some of the main natural resources of Louisiana. Rice, cotton, soybean, sweet potato are some of its major It also has more than 90 chemical plants and 10 refineries of natural gas. It is the major oil and gas producing states of the United States. The first natural gas field was found in the year 1823 in the Louisiana. Because of the natural resources, the state was also the richest in the United States, and it still homes some of the richest industrialists of the US. Not sure if eligible for your ESTA? Check here the requirements. Unlike 48 other states of the United States that are divided into counties Louisiana is divided into parishes, it is so because Louisiana was formed from French and Spanish colonies. It consists of a total of 64 parishes. Lake Pontchartrain Causeway is supposed to be the longest bridge built over water in the world and also has its mention in the gunnies book of world record .often called as causeway the bridge is 24 miles long. Mardi means Tuesday in French and grass means fat, and therefore Mardi grass is also known as Fat Tuesday is the 12-day celebration and is a legal holiday of Louisiana since 1875. It was first celebrated in the year 1699 in the state of Louisiana. There is no other place to celebrate this festival like New Orleans. The one fact that many people don’t know is that Louisiana’s original territory is now divided into 13 states. The government, civil law, marriage, and elections are all bound up by specific rules which also attract tourists to come and explore more about the city. This state as no official language of its own, the main languages that are used here are English, French, Vietnamese and Spanish. One of the most interesting facts about Louisiana is that the shape of the state appears as letter L in the map. It is the biggest producers of crayfish and shrimp in the US. The Saint Charles line is renowned as one of the two mobile national historic monuments that started its service in the year 1835. It was then powered by a steam engine that went to electrification in the year 1893. This is notified as the oldest street railway lines that are still operating. It is the state that proudly boasts about being the manufacturer of c-5 boosters that were part of the Apollo moon landing program. Natchez, bayougoula, chitamacha were the first native American tribes that made Louisiana their home. If you love Louisiana is just the right place, New Orleans is supposed to be the birthplace of the famous jazz, and it has a long history related to Jaz and the Jazz artists. It is also known as the 4th most religious states of the US. Baton Rouge is supposed to be the 2nd largest city of us and is also the capital of the state of Louisana. Rayne was popularly known as the frog capital of the world. Wondering why? It is the story that took shape in the 1880s. The whole thing started when the businessman Jacques Weil and his brothers were in was sampling frog legs. They found out during their sampling that frog legs are very tasty and can be turned into a profitable industry. These restaurants named it as the “Frog Legs from Rayne, Louisiana the Frog Capital of the World.” The state also celebrates frog festival since 1973, and it has been the biggest exporters of frogs, frog legs and frogs skin. The state has a unique law that s based on the Civil Code, these codes were established by the French Emperor Napoleon Bonaparte in 1804, and they are now called as Napoleonic Code. This system is different from all the other states of US and makes it special also because the students who want to choose law as there career and want to practice elsewhere instead of Louisiana they will have to take American law and not Louisiana civil code. Louisiana also suffers from obesity and has 6th highest rates of obesity in adults and the 8th highest rate in between the age group of 10-17. Conrad rice mill situated in New Iberia in the state of Louisiana is registered as the historic places and is also the oldest rice mill that is in operation since 1912. 140 miles long Atchafalaya Basin is known as the largest river basin in the United States and the most productive river basin in North America. 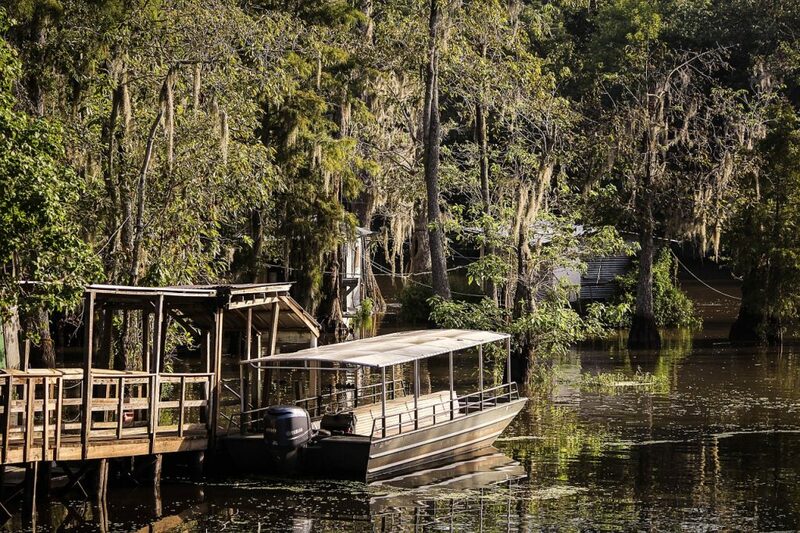 It is home to more than a million acres of bottomland hardwood forest, swamps, black water lakes, and bayous. It is also the biggest habitat of bald eagles in the US. When we go to visit an unknown territory, it is not just the geographical parts that we explore. Along with that, we can also have a taste of the cultural and the additional details as required. So next time you visit Louisiana, you can keep these curious facts in mind.